Wow!!! It is really starting to look like a real house. This is very exciting. We’ve (‘they’ve’, I really haven’t done anything) made a ton of progress in the past few weeks. It is just amazing to watch. Here is where we stand. The interior supports to keep everything level are gone. This means we can walk through the house without limbo-ing around like we are robbing a museum in some crime thriller. The tar paper is on, so it is staying fairly dry in the house now. I spoke with a friend today who did his house a few years ago. His feeling was that after the framing, things are going to look like they are coming to a stand still. They still will be working on things, but it will be more detailed, interior things that you don’t see when you drive by. Plus, we have a fence now. We are also in the stage where we are starting to pick out everything. We picked out gutters and shingles. We have to pick out stone for the chimney, porch & back patio this week. We have our first meeting with the cabinet guy this week. We also need to pick out trim for our windows. We are thinking of a standard Craftsman look for that, but the jury is still out a bit to how Craftsmany we want to go with that. We’ve heard that the windows are going to be showing up sometime soon. Most importantly, we have been ridiculously lucky with the rain this year. Yesterday was only the second day of this project that the guys weren’t able to work. 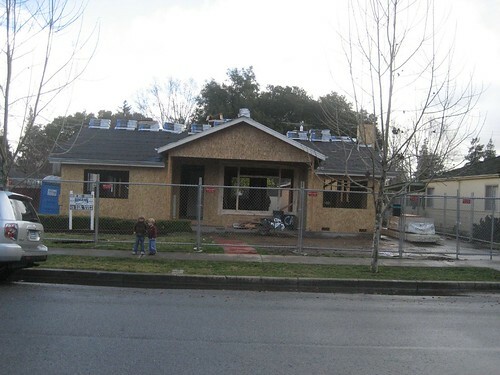 A week or so for everything to dry off and they will be able to wrap the house in Tyvec and start to put up the siding. Now that the roof is on, I’m hoping that things go a bit quicker. We haven’t been to the stone place yet, but here is the link for Peninsula Materials. This is where we will be heading to get our stone.